Robinhood Rentals Of Siesta Key has expanded upon it success to nearby Anna Maria Island. 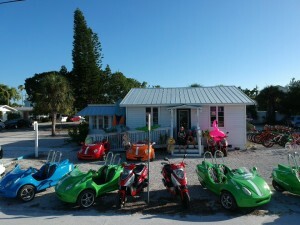 Their new shop, Robinhood Rentals of Anna Maria will feature ScootCoupe Rentals, Street Legal Golf Cart Rentals, Paddle Boards, Bikes, Kayaks and Beach Rentals such as Chairs, Umbrellas and Wagons. They will also have a Robinhood Gift Shop featuring hundreds of tee shirts, hats, coverups, beach toys and everything else you’ll ever need for a weekend on Anna Maria. Mark Toomey, owner and President of Robinhood is excited to have the exclusive ScootCoupe License on the Island. ” Having the ScootCoupe at our new shop was essential for its success, they’re so popular with the visitors we just had to have them”. Given Mr. Toomey’s successful use of the Coupes in Siesta Key, it was only natural for Panther Motors to supply him with all he needs to fill the demand on Anna Maria. Be sure to visit Mark at his new shop and call upon Robinhood Rentals for all your vacation needs when visiting Siesta Key or Anna Maria.